Mirza Faisal Amin, younger brother of BNP secretary general Mirza Fakhrul Islam Alamgir and Thakurgaon municipality mayor, has hailed Prime Minister Sheikh Hasina for implementing a development project in his area, UNB reports. Faisal, also the general secretary of district unit BNP, praised the Prime Minister on Monday while speaking at a programme marking the inauguration of reconstruction work on a 1.75-km road from the municipality’s Swarnakar Patti to Mirza Pump area. The mayor further said, “I thank the Prime Minister as she accepted the demands of our municipality. As a sequel to her announcement, he said an allocation of Tk 1.85 crore was made for the reconstruction of the 1.75-km road of the municipality. Faisal, who elected mayor in 2016, hoped that the trend of such development will also continue in the days to come. “Now, I’m mayor of the municipality while the new mayor will come in the future, but the roads belong to people. So, party matters little here. The development of the area and its people is important,” Faisal observed. He also said it is unfortunate that he could not carry out development as a mayor in his area only for his involvement with the politics of the opposition party. Mentioning that a proposal for the implementation of a Tk 50-crore development project of the municipality has been submitted to the ministry concerned, he urged the MP to put in his best efforts to get it approved. Faisal’s elder brother Mirza Fakhrul was defeated to Ramesh Chandra in the December-30 national election in Thakurgaon-1 constituency with a big margin. 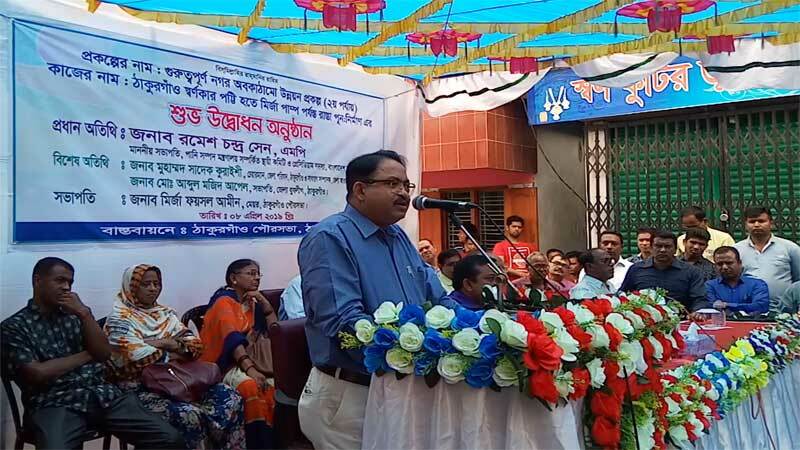 Speaking at the programme as the chief guest, the MP said their government will carry out development activities to turn Thakurgaon Municipality into a model town.